Dandruff is mainly caused due to dryness of the scalp and can be the primary cause for hair fall. There are many shampoos and conditioners which are available to address the issue, but they are loaded with chemicals. 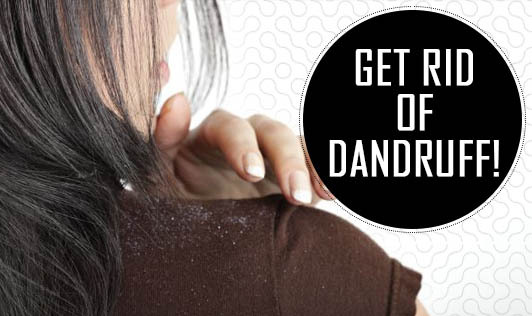 Try these simple things to keep dandruff at bay. • Do not wash your hair excessively as this will cause dryness which triggers dandruff formation. • Brush your hair after washing (after it dries) to distribute oil evenly on the scalp. • Relax and avoid stress. Stress is found to be one of the causes of dandruff. • Massage your hair regularly with olive oil. Olive oil has been found to be effective in getting rid of dandruff. • Neem leaves have been found to be excellent against dandruff. Boil few leaves in water and use the water to wash your hair. • Keep your head covered while going out in the sun. Sun's UV rays can dry your hair causing dandruff. • Avoid sharing your comb/brush with anyone. • Avoid using chemical based shampoos and conditioners. Use natural ones. So, are you ready to wave goodbye to your dandruff?